It’s not a shocker to learn that a blog with a name like stress.health.business. (inaugurated in 2012) has featured more posts about stress than any other topic. However, you may be surprised to see how many different dimensions there are to the stress/productivity/health relationship. So, as we commence our 6th year of the blog, I have anthologized a diverse sampling of our top ten posts on this complex and multi-faceted subject. 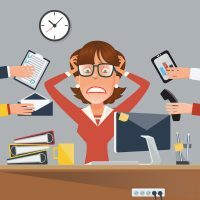 The single most important thing to remember about stress, for companies as well as individuals, is that while it may be inevitable, the effects can be mitigated. There are well-established methods for employees and business leaders to help reduce both individual and organizational stress and to realize the associated gains of better health, increased productivity, improved relationships and greater well-being. Pleased to announce that this post has been mentioned in the recent Productivity Articles roundup episode! You can find the article here: https://www.timecamp.com/blog/index.php/2018/01/productivity-articles-weekly-dose-motivation-15-1-18/. Thank you so much for these excellent tips! Thanks Ola! I am honored by your recognition.